I wouldn’t stare too hard into the eyes of Tom Cruise if I were you. He might start running. 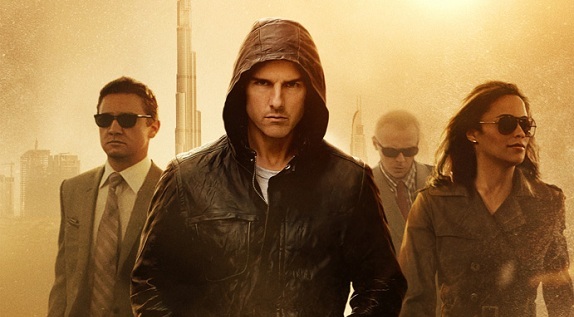 Mission Impossible: Ghost Protocol would have been shockingly good, if I hadn’t known beforehand Brad Bird directed the film. Because I knew that though, I knew at the very least I would be very entertained. The man brought the world The Incredibles and Ratatouille, and for that we are all in his debt. On the surface, it is a fun action movie, something that I think all of us could do with every once in a while. However, from a lot of critics I keep hearing that you shouldn’t look too hard at the plot or the story, that it doesn’t make much sense. The story worked for me, because the underlying theme of the movie made the story work. That said, it is, to say the least, over the top. The basic outline of the plot is that while on a mission to get some information from the archives of the Kremlin, Phelps (Tom Cruise) and his team were framed for blowing up the building. Afterwards, we learn that since the explosion, the US government has shut down Phelps’ organization and they have been disavowed, cut off from all resources and intel apart from what they have on hand, which while fairly impressive, is nowhere near the kind of resources they are used to and incredibly inadequate to the task of BEING TOM CRUISE. Now they have to track down some guy with access to nuclear launch codes so that they can save the world or some such nonsense. While ridiculous on the outside, the truth is, government buildings these days are not the sacred and impenetrable fortresses we like to think they are; the events of 9/11 along with countless embassies and government buildings being bombed over the past 30 years are testament enough to this possibility. In any case, from there, the crux of the plot and the core of the movie is revealed. The world is far more fragile that we realize. Not only that, when you’ve been cut off, everything gets infinitely worse. Phelps and his team are officially in exile, and that should have particular resonance for those who call themselves Christians. Why is that? Exile is in our history. Exile is an essential part of our identity. As Children of the Israelites, and participants in the grand historical narrative of Israel, we share with our Jewish brothers and sisters a history in exile, whether we wish to recognize it or not. In following Christ, we are children of exile ourselves. The early history of the church is rife with persecution and powerlessness, and it wasn’t until the Romans took things over that we lost sight of our exilic identity. So yeah, Ghost Protocol should resonate with us. This team, while highly skilled and given a good headstart in some respects (magnetic robot levitation anybody?) in the end, they were pretty much on their own. Everything that could go wrong on the mission does go wrong. They don’t get any breaks. It’s only by a sheer determination and what I’m recognizing as a sliver of providence that they managed to complete the mission at all. The theme of exile should resonate with us, because we are children of exile. That should, however, give us even more cause to hope for a time when we no longer have to wait for deliverance. This entry was posted in Uncategorized and tagged Exile, Ghost Protocol, Theology, TOM CRUISE. Bookmark the permalink.